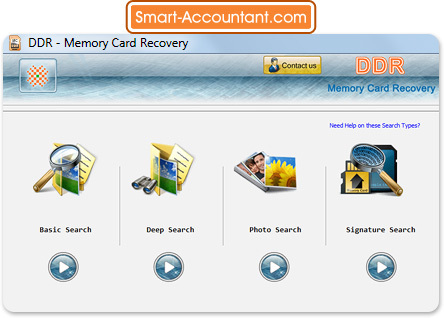 Introduction-Memory Card Data Recovery Software easily recovers and restores lost, deleted or missing files and folders from memory card supportive USB drives. Data retrieval utility first scans the entire drive by Standard, Advance or Raw search and shows the recovered data list in hierarchy format. Digital data restoration software ensures to undelete deleted or misplaced all types of digital files (such as images, digital photo, audio, video etc) from formatted or corrupted removable media memory card device. File revival utility supports all type of memory cards such as XD card, SD card, MMC card, Smart card and many more in all major capacities including 256 MB, 512 MB, 1 GB, 2 GB, 4 GB, 8 GB and even more higher capacities. Affordable recovery software facilitates with in built help menu for user assist and does not require any special skill to operate. Demo is helpful to get full features and working of the software and upon satisfying you can buy full version of the software product. Where Does Memory Card Data Recovery Software Work? Restore lost, erased or missing digital files and folders in its original form. Undelete deleted data from formatted or corrupted memory card. Recover digital pictures, images, audio, video files such as jpeg, jpg, mpg, mpeg, bmp, thmb, 3gp, wma, mp3, mp4, m3u, tiff, mid, midi and many other digital data. Support all type of memory cards that includes SD card, XD card, Compact flash card, Multimedia card, Flash stick, Smart card of digital camera and handheld computer device. Support all major manufacturer of memory cards including Olympus, Kingston, Jet Flash, Acer, BenQ, Canon, Casio, Fujifilm, HP, Jenoptik, Lumicron, Mustek, Nikon, Panasonic, Pentax, Philips, Praktica, Relisys, Ricoh, Samsung, Sanyo, Sony, Umax, Vivitar, Yakumo etc. Revive data even if windows displays error messages like invalid media or inaccessible the device. Preview recovered digital data in tree structure format. Facilitate with user guide for other user’s assist. Cost effective utility provided with user friendly interface.